Panama ( ; Spanish: Panamá [panaˈma]), officially called the Republic of Panama (Spanish: República de Panamá), is a country in Central America. It is bordered by Costa Rica to the west, Colombia (in South America) to the southeast, the Caribbean Sea to the north and the Pacific Ocean to the south. The capital and largest city is Panama City, whose metropolitan area is home to nearly half of the country's 4 million people. The best-known version is that a fishing village and its nearby beach bore the name "Panamá", which meant "an abundance of fish". Captain Antonio Tello de Guzmán, while exploring the Pacific side in 1515, stopped in the small indigenous fishing town. In 1517 Don Gaspar De Espinosa, a Spanish lieutenant, decided to settle a post there. In 1519 Pedrarias Dávila decided to establish the Empire's Pacific city in this site. The new settlement replaced Santa María La Antigua del Darién, which had lost its function within the Crown's global plan after the beginning of the Spanish exploitation of the riches in the Pacific. Rodrigo de Bastidas sailed westward from Venezuela in 1501 in search of gold, and became the first European to explore the isthmus of Panama. A year later, Christopher Columbus visited the isthmus, and established a short-lived settlement in the Darien. Vasco Núñez de Balboa's tortuous trek from the Atlantic to the Pacific in 1513 demonstrated that the isthmus was, indeed, the path between the seas, and Panama quickly became the crossroads and marketplace of Spain's empire in the New World. Gold and silver were brought by ship from South America, hauled across the isthmus, and loaded aboard ships for Spain. The route became known as the Camino Real, or Royal Road, although it was more commonly known as Camino de Cruces (Road of Crosses) because of the number of gravesites along the way. Panama was under Spanish rule for almost 300 years (1538–1821), and became part of the Viceroyalty of Peru, along with all other Spanish possessions in South America. From the outset, Panamanian identity was based on a sense of "geographic destiny", and Panamanian fortunes fluctuated with the geopolitical importance of the isthmus. The colonial experience also spawned Panamanian nationalism as well as a racially complex and highly stratified society, the source of internal conflicts that ran counter to the unifying force of nationalism. In 1538 the Real Audiencia de Panama was established, initially with jurisdiction from Nicaragua to Cape Horn before the conquest of Peru. A Real Audiencia (royal audiencia) was a judicial district that functioned as an appeals court. Each audiencia had an oidor (Spanish: hearer, a judge). Spanish authorities had little control over much of the territory of Panama. Large sections managed to resist conquest and missionization until very late in the colonial era. Because of this, indigenous people of the area were often referred to as "indios de guerra" (war Indians) and resisted Spanish attempts to conquer them or missionize them. However, Panama was enormously important to Spain strategically because it was the easiest way to transship silver mined in Peru to Europe. Silver cargoes were landed at Panama and then taken overland to Portobello or Nombre de Dios on the Caribbean side of the isthmus for further shipment. Because of the incomplete Spanish control, the Panama route was vulnerable to attack from pirates (mostly Dutch and English), and from 'new world' Africans called cimarrons who had freed themselves from enslavement and lived in communes or palenques around the Camino Real in Panama's Interior, and on some of the islands off Panama's Pacific coast. One such famous community amounted to a small kingdom under Bayano, which emerged in the 1552 to 1558. Sir Francis Drake's famous raids on Panama in 1572–73 and John Oxenham's crossing to the Pacific Ocean were aided by Panama cimarrons, and Spanish authorities were only able to bring them under control by making an alliance with them that guaranteed their freedom in exchange for military support in 1582. In 1744 Bishop Francisco Javier de Luna Victoria DeCastro established the College of San Ignacio de Loyola and on June 3, 1749, founded La Real y Pontificia Universidad de San Javier. By this time, however, Panama's importance and influence had become insignificant as Spain's power dwindled in Europe and advances in navigation technique increasingly permitted to round Cape Horn in order to reach the Pacific. 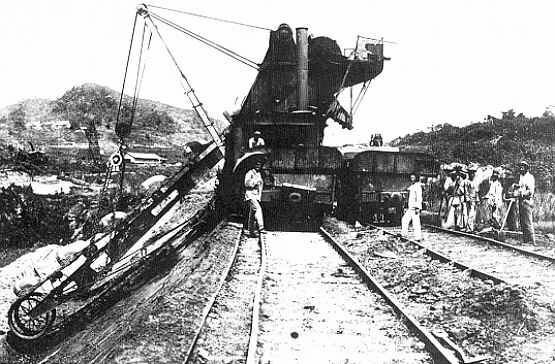 While the Panama route was short it was also labor-intensive and expensive because of the loading and unloading and laden-down trek required to get from the one coast to the other. During the last half of the 18th century and the first half of the 19th century, migrations to the countryside decreased Panama City's population and the isthmus' economy shifted from the tertiary to the primary sector. What they had counted on, however, was the influence of the separatists in the capital. Ever since October 1821, when the former Governor General, Juan de la Cruz Murgeón, left the isthmus on a campaign in Quito and left the Veraguan colonel in charge, the separatists had been slowly converting Fábrega to the separatist side. So, by November 10, Fábrega was now a supporter of the independence movement. Soon after the separatist declaration of Los Santos, Fábrega convened every organization in the capital with separatist interests and formally declared the city's support for independence. No military repercussions occurred because of the skillful bribing of royalist troops. In the first 80 years following independence from Spain, Panama was a department of Colombia, after voluntarily joining it at the end of 1821. The people of the isthmus made several attempts to secede and came close to success in 1831, and again during the Thousand Days' War of 1899–1902. The Thousand Days' War is understood among indigenous Panamanians as a struggle for land rights under the leadership of Victoriano Lorenzo. In November 1903 Panama proclaimed its independence and concluded the Hay–Bunau-Varilla Treaty with the United States. The treaty granted rights to the United States "as if it were sovereign" in a zone roughly 16 km (10 mi) wide and 80 km (50 mi) long. In that zone, the U.S. would build a canal, then administer, fortify, and defend it "in perpetuity". (see Pizzurno Gelós and Araúz, Estudios sobre el Panamá republicano 508). During Omar Torrijos's control, the military regime transformed the political and economic structure of the country by initiating massive coverage of social security services and expanding public education. The constitution was changed in 1972. For the reform to the constitution, the military created a new organization, the Assembly of Corregimiento Representatives, which replaced the National Assembly. The new assembly, also known as the Poder Popular ("Power of the People"), was composed of 505 members selected by the military with no participation from political parties, which the military had eliminated. The new constitution proclaimed Omar Torrijos the "Maximum Leader of the Panamanian Revolution", and conceded him unlimited power for six years, although, to keep a façade of constitutionality, Demetrio B. Lakas was appointed president for the same period (Pizzurno Gelós and Araúz, Estudios sobre el Panamá republicano 541). In 1981 Torrijos died in a mysterious plane crash. Torrijos' death altered the tone of Panama's political evolution. Despite the 1983 constitutional amendments, which proscribed a political role for the military, the Panama Defense Forces (PDF), as they were then known, continued to dominate Panamanian political life. By this time, General Manuel Antonio Noriega was firmly in control of both the PDF and the civilian government. On June 6, 1987, the recently retired Colonel Roberto Díaz Herrera, resentful that Noriega's broke the agreed "Torrijos Plan" of succession that would have made him the chief of the military after Noriega, decided to denounce the regime. He revealed details of the electoral fraud, accused Noriega of planning Torrijos's death and declared that Torrijos had received 12 million dollars from the Shah of Iran for giving the exiled Iranian leader asylum. He also accused Noriega of the assassination by decapitation of then opposition leader Dr. Hugo Spadafora. United States President Ronald Reagan began a series of sanctions against the military regime. The United States froze economic and military assistance to Panama in the middle of 1987 in response to the domestic political crisis in Panama and an attack on the U.S. Embassy. Yet these sanctions did little to overthrow Noriega but instead severely damaged Panama's economy. The sanctions hit the Panamanian population hard and caused the Gross Domestic Product (GDP) to decline almost 25% between 1987–1989 (see Acosta n.p.). In April 1988, the U.S. President Ronald Reagan invoked the International Emergency Economic Powers Act, freezing Panamanian government assets in all U.S. organizations. In May 1989 Panamanians voted overwhelmingly for the anti-Noriega candidates. The Noriega regime promptly annulled the election and embarked on a new round of repression. The United States government said Operation Just Cause, which commenced on December 20, 1989, was "necessary to safeguard the lives of U.S. citizens in Panama, defend democracy and human rights, combat drug trafficking, and secure the neutrality of the Panama Canal as required by the Torrijos–Carter Treaties" (New York Times, A Transcript of President Bush's Address n.p.). Human Rights Watch wrote in the 1989 report: "Washington turned a blind eye to abuses in Panama for many years until concern over drug trafficking prompted indictments of the general [Noriega] by two grand juries in Florida in February 1988". The U.S. reported 23 servicemen killed and 324 wounded, with Panamanian casualties estimated around 450. Described as a surgical maneuver, the action led to civilian deaths whose estimated numbers range from 400 to 4,000 during the two weeks of armed activities. This surgical maneuver represented the largest United States military operation to that date since the end of the Vietnam War (Cajar Páez 22) The United Nations put the Panamanian civilian death toll at 500, while other sources had higher statistics. The number of U.S. civilians (and their dependents), who had worked for the Panama Canal Commission and the U.S. Military, and were killed by the Panamanian Defense Forces, has never been fully disclosed. On December 29, the UN General Assembly approved a resolution calling the intervention in Panama a "flagrant violation of international law and of the independence, sovereignty and territorial integrity of the States". A similar resolution was vetoed in the Security Council by the United States, the United Kingdom, and France. The urban population, with many living below the poverty level, was greatly affected by the 1989 intervention. As pointed out in 1995 by a UN Technical Assistance Mission to Panama, the bombardments during the invasion caused the displacement of 20,000 people. The most heavily affected district was impoverished El Chorrillo, where several blocks of apartments were completely destroyed. El Chorrillo had been built in days of Canal construction, a series of wooden barracks which easily caught fire under the United States attack. The economic damage caused by the intervention has been estimated to be between 1.5 and 2 billion dollars. n.p. Most Panamanians supported the intervention. Panama's Electoral Tribunal moved quickly to restore the civilian constitutional government, reinstated the results of the May 1989 election on December 27, 1989, and confirmed the victory of President Guillermo Endara and Vice Presidents Guillermo Ford and Ricardo Arias Calderon. Perez Balladares ran as the candidate for a three-party coalition dominated by the Democratic Revolutionary Party (PRD), the erstwhile political arm of military dictatorships. Perez Balladares worked skillfully during the campaign to rehabilitate the PRD's image, emphasizing the party's populist Torrijos roots rather than its association with Noriega. He won the election with only 33% of the vote when the major non-PRD forces splintered into competing factions. His administration carried out economic reforms and often worked closely with the U.S. on implementation of the Canal treaties. Conservative supermarket magnate Ricardo Martinelli was elected to succeed Martin Torrijos with a landslide victory in the May 2009 presidential election. Mr. Martinelli's business credentials drew voters worried by slowing growth due to the world financial crisis. Standing for the four-party opposition Alliance for Change, Mr. Martinelli gained 60% of the vote, against 37% for the candidate of the governing left-wing Democratic Revolutionary Party. The highest point in the country is the Volcán Barú, which rises to 3,475 metres (11,401 feet). A nearly impenetrable jungle forms the Darién Gap between Panama and Colombia where Colombian guerrilla and drug dealers are operating with hostage-taking. This and forest protection movements create a break in the Pan-American Highway, which otherwise forms a complete road from Alaska to Patagonia. Panama's wildlife holds the most diversity of all the countries in Central America. It is home to many South American species as well as North American wildlife. Nearly 500 rivers lace Panama's rugged landscape. Mostly unnavigable, many originate as swift highland streams, meander in valleys, and form coastal deltas. However, the Río Chagres (Chagres River), located in central Panama, is one of the few wide rivers and a source of enormous hydroelectric power. The central part of the river is dammed by the Gatun Dam and forms Gatun Lake, an artificial lake that constitutes part of the Panama Canal. The lake was created between 1907 and 1913 by the building of the Gatun Dam across the Río Chagres. When it was created, Gatun Lake was the largest man-made lake in the world, and the dam was the largest earth dam. The river drains northwest into the Caribbean. The Kampia and Madden Lakes (also filled from the Río Chagres) provide hydroelectricity for the area of the former Canal Zone. The Río Chepo, another source of hydroelectric power, is one of the more than 300 rivers emptying into the Pacific. These Pacific-oriented rivers are longer and slower running than those of the Caribbean side. Their basins are also more extensive. One of the longest is the Río Tuira, which flows into the Golfo de San Miguel and is the nation's only river navigable by larger vessels. The Caribbean coastline is marked by several good natural harbors. However, Cristóbal, at the Caribbean terminus of the canal, had the only important port facilities in the late 1980s. The numerous islands of the Archipiélago de Bocas del Toro, near the Beaches of Costa Rica, provide an extensive natural roadstead and shield the banana port of Almirante. The over 350 San Blas Islands, near Colombia, are strung out for more than 160 kilometres (99 miles) along the sheltered Caribbean coastline. Currently, the terminal ports located at each end of the Panama Canal, namely the Port of Cristobal and the Port of Balboa, are ranked second and third respectively in Latin America in terms of numbers of containers units (TEU) handled. The Port of Balboa covers 182 hectares and contains four berths for containers and two multi-purpose berths. In total, the berths are over 2,400 metres (7,900 feet) long with alongside depth of 15 metres (49 feet). The Port of Balboa has 18 super post-Panamax and Panamax quay cranes and 44 gantry cranes. The Port of Balboa also contains 2,100 square metres (23,000 square feet) of warehouse space. Excellent deep water ports capable of accommodating large VLCC (Very Large Crude Oil Carriers) are located at Charco Azul, Chiriquí (Pacific) and Chiriquí Grande, Bocas del Toro (Atlantic) near Panama's western border with Costa Rica. The Trans-Panama pipeline, running across the isthmus with a length of 131 kilometres (81 miles), has been operating between Charco Azul and Chiriquí Grande since 1979. Panama's tropical environment supports an abundance of plants. Forests dominate, interrupted in places by grasslands, scrub, and crops. Although nearly 40% of Panama is still wooded, deforestation is a continuing threat to the rain-drenched woodlands. Tree cover has been reduced by more than 50% since the 1940s. Subsistence farming, widely practiced from the northeastern jungles to the southwestern grasslands, consists largely of corn, bean, and tuber plots. Mangrove swamps occur along parts of both coasts, with banana plantations occupying deltas near Costa Rica. In many places, a multi-canopied rain forest abuts the swamp on one side of the country and extends to the lower reaches of slopes in the other. For all people national elections are universal and mandatory for all citizens 18 years and older. National elections for the executive and legislative branches take place every five years. Members of the judicial branch (justices) are appointed by the head of state. Panama's National Assembly is elected by proportional representation in fixed electoral districts, so many smaller parties are represented. Presidential elections do not require a simple majority; out of the four last presidents only one, incumbent president Ricardo Martinelli, was elected with over 50% of the popular vote. Since the end of Manuel Noriega's military dictatorship in 1989, Panama has successfully completed four peaceful transfers of power to opposing political factions. The political landscape is dominated by two major parties and many smaller parties, many of which are driven by individual leaders more than ideologies. Former President Martin Torrijos is the son of general Omar Torrijos. He succeeded Mireya Moscoso, the widow of Arnulfo Arias. Panama's most recent national elections occurred on May 4, 2014 with Incumbent Vice-President Juan Carlos Varela declared the victor. The United States cooperates with the Panamanian government in promoting economic, political, security, and social development through U.S. and international agencies. Cultural ties between the two countries are strong, and many Panamanians come to the United States for higher education and advanced training. The Panamanian Public Forces are the national security forces of Panama. Panama is the second country in Latin America (the other being Costa Rica) to permanently abolish standing armies. Panama maintains armed police and security forces, and small air and maritime forces. They are tasked with law enforcement and can perform limited military actions. Panama is divided into ten provinces with their respective local authorities (governors), which are divided into districts and corregimientos (townships). Also, there are five Comarcas (literally: "Shires") populated by a variety of indigenous groups. According to the CIA World Factbook, as of 2012 Panama had an unemployment rate of 2.7%. A food surplus was registered in August 2008. On the Human Development Index, Panama ranked 60th in 2015. In recent years, Panama's economy has experienced a boom, with growth in real gross domestic product (GDP) averaging over 10.4% in the 2006–2008 period. Panama's economy has been among the fastest growing and best managed in Latin America. The Latin Business Chronicle predicted that Panama would be the fastest growing economy in Latin America during the five years period 2010–14, matching Brazil's 10% rate. Panama's economy, because of its key geographic location, is mainly based on a well developed service sector especially commerce, tourism, and trading. The handover of the Canal and military installations by the United States has given rise to large construction projects. A project to build of a third set of locks for the Panama Canal A was overwhelmingly approved in referendum (with low voter turnout, however) on October 22, 2006. The official estimated cost of the project is US$5.25 billion. The canal is of major economic importance because it provides millions of dollars of toll revenue to the national economy and provides massive employment. Transfer of control of the Canal to the Panamanian government completed in 1999, after being controlled by the US for 85 years. Since the early 20th century, Panama has built, thanks to the revenues of the canal, the largest International Financial Center (IFC) in the Central America region, with consolidated assets representing more than three times Panama’s GDP. The banking sector employs more than 24,000 people directly. Financial intermediation contributed 9.3 percent of GDP. Stability has been a key strength to Panama financial sector, which has benefited from the country's favorable economic and business climate. The banking institutions have continued to report sound growth and solid financial earnings. The banking supervisory regime is largely compliant with the Basel Core Principles for Effective Banking Supervision. As an international financial center, Panama exports its services mainly to Central and Latin America and is a fundamental part of the connectivity of the country's economy. Panama had a reputation worldwide for being a tax haven but have agreed for enhanced transparency especially since the release in 2016 of the Panama Papers. Significant progress have been made to improve full compliance to anti-money laundering recommendations. Panama was removed from the FATFGAFI gray list in February 2016. However efforts remain to be made, the IMF repeatedly mentions the need to strengthen financial transparency and fiscal structure. Panama is home to Tocumen International Airport, Central America's largest airport. Additionally there are more than 20 smaller airfields in the country. See list of airports in Panama. Currently, Panama has modern buses known as Metrobuses, along with a Metro line. Formerly, the system was dominated by colorfully painted diablos rojos, with some remaining. A diablo rojo is usually "customized" or painted with bright colors, usually depicting famous actors, politicians or singers. Panama City's streets experience frequent traffic jams due to poor planning for the now extensive private vehicle fleet. Tourism in Panama is rapidly growing. It has maintained its growth over the past five years due to government tax and price discounts to foreign guests and retirees. These economic incentives have caused Panama to be regarded as a relatively good place to retire in the world. Real estate developers in Panama have increased the number of tourism destinations in the past five years because of the interest for these visitor incentives. 2,200,000 tourists arrived in 2012. The number of tourists from Europe grew by 23.1% during the first nine months of 2008. According to the Tourism Authority of Panama (ATP), from January to September, 71,154 tourists from Europe entered Panama, which is 13,373 more than figures for same period the previous year. Most of the European tourists were Spaniards (14,820), followed by Italians (13,216), French (10,174) and British (8,833). There were 6997 from Germany, the most populous country in the European Union. Europe has become one of the key markets to promote Panama as a tourist destination. In 2012, 4.345.5 million entered into the Panamanian economy as a result of tourism. This accounted for 9.5% of gross domestic product in the country, surpassing other productive sectors. Panama enacted Law No. 80 in 2012 for the promotion of foreign investment in tourism. Law 80 replaced an older Law 8 of 1994. Law 80 provides 100% exemption from income tax and real estate taxes for 15 years, duty-free imports for construction materials and equipment for five years, and capital gains tax exemption for five years. The Panamanian currency is officially the balboa, fixed at a rate of 1:1 with the United States dollar since Panamanian independence in 1903. In practice Panama is dollarized: US dollars are legal tender and used for all paper currency, while Panama has its own coinage. Because of the tie to US dollars, Panama has traditionally had low inflation. According to the Economic Commission for Latin American and the Caribbean, Panama's inflation in 2006 was 2.0% as measured by weight Consumer Price Index (CPI). The balboa replaced the Colombian peso in 1904 after Panama's independence. Balboa banknotes were printed in 1941 by President Arnulfo Arias. They were recalled several days later, giving them the name "The Seven Day Dollar". The notes were burned by the new government, but occasionally balboa notes can be found in collections. These were the only banknotes ever issued by Panama and U.S. notes have circulated both before and since. The high levels of Panamanian trade are in large part from the Colón Free Trade Zone, the largest free trade zone in the Western Hemisphere. Last year the zone accounted for 92% of Panama's exports and 64% of its imports, according to an analysis of figures from the Colon zone management and estimates of Panama's trade by the United Nations Economic Commission for Latin America and the Caribbean. Panama's economy is also very much supported by the trade and export of coffee and other agricultural products. Panama recorded a population of 4,058,374 in its 2016 census. The proportion of the population aged below 15 in 2010 was 29%. 64.5% of the population were aged between 15 and 65, with 6.6% of the population being 65 years or older. More than half the population lives in the Panama City–Colón metropolitan corridor, which spans several cities. Panama's urban population exceeds 75%, making Panama's population the most urbanized in Central America. In 2010 the population was 65% Mestizo (mixed white, Native American), 12.3% Native Americans, 9.2% Black or African descent, 6.8% Mulatto, and 6.7% White. 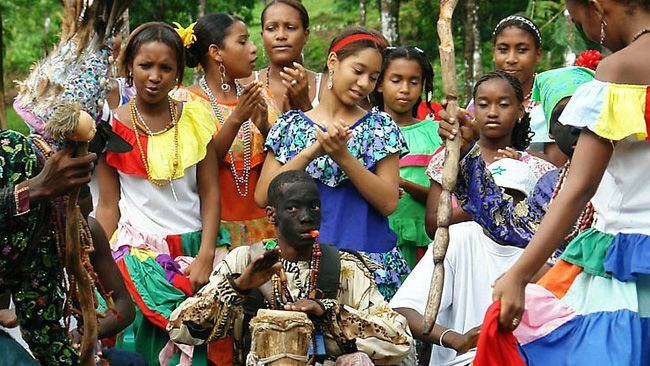 Ethnic groups in Panama include Mestizo people, who are a mix of European and native ancestry. Black, or Afro-Panamanians account for 15–20% of the population. Most Afro-Panamanians live on the Panama-Colón metropolitan area, the Darien Province, La Palma, and Bocas Del Toro. Neighborhoods in Panama City that have large black populations include: Curundu, El Chorrillo, Rio Abajo, San Joaquín, El Marañón, San Miguelito, and Santa Ana. Black Panamanians are descendants of African slaves brought to the Americas on the Atlantic Slave Trade. The second wave of black people brought to Panama came from the Caribbean during the construction of the Panama Canal. Panama also has a considerable Chinese and Indian (India) population. They were brought to work on the canal during its construction. Most Chinese-Panamanians reside in the province of Chiriquí. Europeans and white-Panamanians are a minority in Panama. Panama is also home to a small Arab community that have Mosques to practice Islam. Spanish is the official and dominant language. The Spanish spoken in Panama is known as Panamanian Spanish. About 93% of the population speak Spanish as their first language, though many citizens who hold jobs at international levels, or who are a part of business corporations speak both English and Spanish. Native languages, such as Ngäbere, are spoken throughout the country, mostly in their native grounds. Over 400,000 Panamanians hold their native languages and customs. Some new statistics show that as second language, English is spoken by 10%, French by 4% and Arabic by 1%. The government of Panama does not collect statistics on the religious affiliation of citizens, but various sources estimate that 75% to 85% of the population identifies itself as Roman Catholic and 15%–25% as Protestant. The Bahá'í Faith community of Panama is estimated at 2.00% of the national population, or about 60,000 including about 10% of the Guaymí population. The Church of Jesus Christ of Latter-day Saints (LDS Church) claim more than 40,000 members. Smaller religious groups include Seventh-day Adventists, Jehovah's Witnesses, Episcopalians with between 7,000 and 10,000 members, Jewish and Muslim communities with approximately 10,000 members each, Hindus, Buddhists, and other Christians. Indigenous religions include Ibeorgun (among Kuna) and Mamatata (among Ngobe). There are also a small number of Rastafarians. Originally, during the 16th century, education in Panama was provided by Jesuit priests. Public education, as a national and governmental institution, began in 1903. The principles underlying this early education system were that children should receive different types of education in accordance with their social class and therefore the position they were expected to occupy in society. Public education began in Panama soon after the separation from Colombia in 1903. The first efforts were guided by an extremely paternalistic view of the goals of education, as evidenced in comments made in a 1913 meeting of the First Panamanian Educational Assembly, "The cultural heritage given to the child should be determined by the social position he will or should occupy. For this reason education should be different in accordance with the social class to which the student should be related." This elitist focus changed rapidly under United States influence. In 2010, it was estimated that 94.1% of the population was literate (94.7% of males and 93.5% of females). Education in Panama is compulsory for the children of age group between 6 and 18. In recent decades, school enrollment at all levels, but especially at upper levels, has increased significantly. Panama used to participate in the PISA exams but due to debts and unsatisfactory exam results is postponing participation until 2018. The culture of Panama derived from European music, art and traditions brought over by the Spanish to Panama. Hegemonic forces have created hybrid forms of this by blending African and Native American culture with European culture. For example, the tamborito is a Spanish dance that was blended with African rhythms, themes and dance moves. Dance is a symbol of the diverse cultures that have coupled in Panama. The local folklore can be experienced through a multitude of festivals, dances and traditions that have been handed down from generation to generation. Local cities host live reggae en español, reggaeton, haitiano (compas), jazz, blues, salsa, reggae, and rock music performances. Outside Panama City, regional festivals take place throughout the year featuring local musicians and dancers. Panama's blended culture is reflected in traditional products, such as woodcarvings, ceremonial masks and pottery, as well as in Panama's architecture, cuisine and festivals. In earlier times, baskets were woven for utilitarian uses, but now many villages rely almost exclusively on the baskets they produce for tourists. The Christmas parade, known as El desfile de Navidad, is celebrated in the capital, Panama City. This holiday is celebrated on December 25. 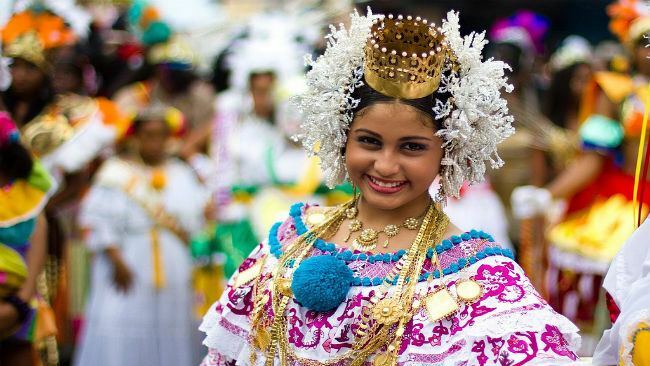 The floats in the parade are decorated with the Panamanian colors, and the women dress in dresses called Pollera while the men dress in the traditional Montuno. In addition, the marching band in the parade, consisting of drummers, keeps the crowds entertained. In the city, a big Christmas tree is lit with Christmas lights, and everybody surrounds the tree and sings Christmas carols. Panamanian men's traditional clothing, called Montuno, consists of white cotton shirts, trousers and woven straw hat. The traditional women's clothing is the Pollera. It originated in Spain in the 16th century, and by the early 1800s it was a typical in Panama, worn by women servants, especially wet nurses (De Zarate 5). Later, it was adopted by upper-class women. The original pollera consists of a ruffled blouse worn off the shoulders and a skirt is on the waistline with gold buttons. The skirt is also ruffled, so that when it is lifted up, it looks like a peacock's tail or a mantilla fan. The designs on the skirt and blouse are usually flowers or birds. Two large matching pom poms (mota) are on the front and back, four ribbons hang from the front and back on the waist line, five gold chains (caberstrillos) hang from the neck to the waist, a gold cross or medallion on a black ribbon is worn as a choker, and a silk purse is worn on the waistline. Earrings (zaricillos) are usually gold or coral. Slippers usually match the color of the pollera. Hair is usually worn in a bun, held by three large gold combs that have pearls (tembleques) worn like a crown. Quality pollera can cost up to $10,000, and may take a year to complete. Today, there are different types of polleras; the pollera de gala consists of a short-sleeved ruffle skirt blouse, two full-length skirts and a petticoat. Girls wear tembleques in their hair. Gold coins and jewelry are added to the outfit. The pollera montuna is a daily dress, with a blouse, a skirt with a solid color, a single gold chain, and pendant earrings and a natural flower in the hair. Instead of an off-the-shoulder blouse is a fitted white jacket with, shoulder pleats, and a flared hem. Traditional clothing in Panama can be worn in parades, where the females and males do a traditional dance. Females do a gentle sway and twirl their skirts, while the men hold their hats in their hands and dance behind the females. The U.S. influence in Panama can be seen in the country's sports. Baseball is Panama's national sport and the country has regional teams and a national team that represents it in international events. At least 140 Panamanian players have played professional baseball in the United States, more than any other Central American country. Notable players include Bruce Chen, Rod Carew, Mariano Rivera, Carlos Lee, Manny Sanguillén, and Carlos Ruiz. Since the end of the 20th century, football has become a popular sport for Panamanians, the national league and the national team has featured a good progress, their legendary players are such as Luis Ernesto Tapia, Rommel Fernández, the Dely Valdes Brothers: Armando, Julio and Jorge; and recent players as Jaime Penedo, Felipe Baloy, Luis Tejada, Blas Perez, Roman Torres and Harold Cummings. Basketball is popular in Panama. There are regional teams as well as a squad that competes internationally. Two of Panama's prominent basketball players are Rolando Blackman, a four-time NBA All-Star, and Kevin Daley, a 10-year captain and showman of the Harlem Globetrotters. Panama was one of the few countries that did not enter an INDC at COP21.